Agriculture has to change if the world is going to feed itself beyond 2030 – and for that to happen, farmers have to adopt smart technology as quickly as possible. 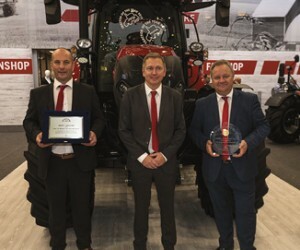 That was the overriding message of the 43rd edition of EIMA International, the biannual agricultural machinery show organized by FederUnacoma and held from 7-12 November at the Bologna Fiera exhibition grounds in Bologna, Italy. So important has digital become, in fact, that FederUnacoma general director Simona Rapastella announced at a press conference on 6 November the launch of the new EIMA Digital space dedicated to precision electronic and computer systems, software for agricultural machinery, control units and agricultural drones. Of course, just as in South Africa, the older generation find it difficult to adapt to new technology, so it is up to the younger generation to take up the reins, Rapastella emphasised. For that reason, EIMA 2018 made provision for new agricultural entrepreneurs, the future generation of professionals interested in the agricultural machinery industry and in the sales and assistance networks, and secondary school and university students seeking specific training in the sector. Equally central to EIMA 2018 was the topic of water, as reflected by the launch of the new Idrotech Exhibition, intended to become a reference for the technical, political and strategic aspects of water. EIMA 2018 was visited by 317 thousand people, 11% more than the last edition (2016), including 50 thousand foreign delegates from 150 countries, with 1 950 exhibitors occupying a massive 375 000 square metres of space. The use of big data in agriculture was the theme of Image Line’s conference “Data and Agriculture — more income, more efficiency, more traceability”. As FederUnacoma president Alessandro Malavolti underlined, data collected by new digital technologies make it possible to optimize the operations in the field, manage expenses in a targeted manner, and cut production waste. “Big data is not only tables of numbers, it is also photos, images, videos, emails, exchanges of messages on social media, or sharing of information between machines, for example between tractors and equipment,” said Cristiano Spadoni, head of Marketing at Image Line. “Already today 40% of farms employ productive techniques that fall under agriculture 4.0, while 70% of farmers sampled are interested in using integrated platforms for data management and decision-making support systems on smartphones,” said Filippo Renga, director of the Smart Agrifood Observatory, in presenting the preliminary results of a study conducted with the Milan Polytechnic and the University of Brescia. As always, the real challenge is to reduce production costs – and costs are only going to rise. The solution lies not only in big data and artificial intelligence but also the remote management of machine support services. Soon, according to Erik Hogerviorst, president of the CLIMMAR agricultural machinery dealer association, dealers will be able to remotely manage a wide range of services on mechanical vehicles. In the not-too-distant future, any kind of problem will be managed and solved through digital processes, eliminating the need for direct human intervention. A second conference promoted by Dronitaly predicted that agriculture could become the second largest user of drones in the world by 2023. As noted in a statement by Dronitaly, “the use of drones in agriculture has drawn attention to the need to reinvent traditional professional figures in the sector to bring agriculture towards the 4.0. era”. In the context of climate change, drones can prove to be valuable allies of farming communities. Agriculture is the most water-hungry production sector, absorbing some 69% of the world’s total water resources. However, sensors, drones and satellites can save up to 30% water savings to cope with the increase in population. The disruptive effect of drought on food production and prices came to the fore during a panel discussion entitled “Water resources, a global challenge”, featuring speakers including Stefano Baldi (Nomisma), Marco Bezzi (Tera Engineering), and Jacopo Fratus De Balestrini (Assomao/FederUnacoma). A study by Nomisma showed that the amount of irrigated farmland is growing internationally, standing at 334 million hectares today. However, the projected increase in world population to 9.7 billion people in 2050 compared to the current 7.6 billion requires new water-wise strategies. The answer lies in smart technology, from sensors capable of measuring soil moisture to satellites capable of providing valuable data on the state of plant health every five days, but it all needs to be integrated into a single system. This in turn requires campaigns to raise awareness among farmers in order to encourage technology transfers. 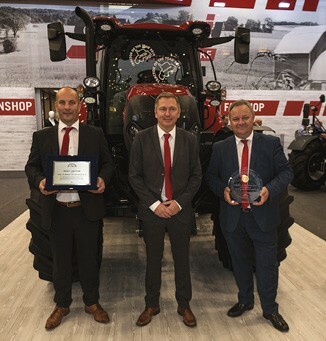 The title of Tractor of the Year 2019 and Best Design 2019 went to the Case IH Maxxum 145 Multicontroller. Launched last year alongside three smaller 116-135hp (rated) models, the highlights of the 145hp Maxxum 145 Multicontroller include its ActiveDrive 8 eight-step semi-powershift transmission and the Multicontroller armrest and joystick, attributes recognised by TOTY judges — professional farm machinery journalists from across Europe — for aiding ease of operation and enhancing efficiency. Maxxum tractors are also available with four-step powershift and continuously-variable transmissions. Among the many other technological innovations (28 in total) on display at EIMA 2018, Carraro Agritalia’s hydrid diesel-and-electricity tractor was a market first. Eco-friendly and cost-effective, it also requires little maintenance and guarantees greater productivity compared to traditional means. Sustainability was the hallmark of several other new products. For example, Aermatica 3D exhibited a drone that enables variable-rate pesticide distribution according to the needs of land and crops. This does away with unnecessary dispersion even under extreme conditions, such as on particularly steep slopes. Another particularly innovative offering was Cima’s pneumatic sprayer with anti-drift diffuser, which significantly reduces pollution by improving pesticide accuracy. MDB impressed with a tracked machine somewhere between a tractor and a telescopic handler, its simultaneously operating mowing arm and front shredder affording greater visibility when moving grass and shrubs than traditional crawlers. Defeating poverty by helping women to become agricultural entrepreneurs is the aim of the Africa Hand Project, an initiative for the development of sustainable agriculture created by the non-profit organization CEFA and presented at EIMA. The project will provide training and services to women farmers in Mozambique to help them become financially autonomous. In a country where 44% of children under the age of five suffer from malnutrition, empowered women can change the future. “Our goal is to promote the development of a sustainable economy in Mozambique, which is characterized by extreme poverty, through a primary sector such as that of agriculture,” explained CEFA president Raoul Mosconi. The project is funded by remote donors who contribute 150 euros a year, enough for a Mozambican farmer to buy a cow and receive the appropriate training to start milk production and sales. The end result: a value chain that contributes to the development of the entire territory. The Africa Hand Project will be rolled out in other African countries in due course.